Looking for a great midnight snack? Try this—a skillet-grilled cheese sandwich with a hearty pork roast and ham filling. Heat lightly oiled baking sheet and cast iron skillet in oven. Spread bottom halves of with mayo; spread top halves with mustard. Fill with pickles, cheese, roast pork and ham. Place on heated baking sheet. Brush tops with butter. Place heated skillet on tops of sandwiches to flatten slightly. Bake 5 min. or until sandwiches are crisp on both sides and heated through. 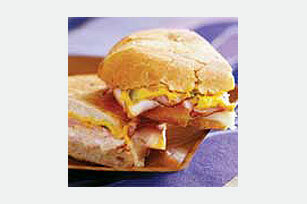 Enjoy a serving of this classic sandwich on a special occasion. Substitute roasted turkey for the pork roast. Prepare using Cuban rolls. Or you can use French bread rolls, ends trimmed and cut lengthwise in half.